Saves the defaults from the Setup Wizard as User Defaults - to be used for new models, or in a File which you can manually load into other models. User Defaults - reload the last user default you saved. Load Factory Defaults - reloads all defaults and other values to their original setting. 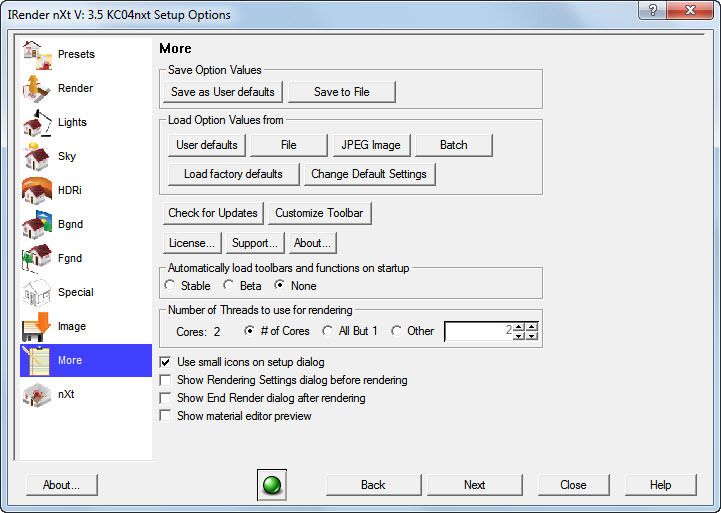 Change Default Settings - changes to defaults for small, medium and large rendering size. Check for Updates - load the download page to see if a new version is available. License - load the License and Authorization dialog. Support - load a special dialog of additional settings. - Use if you have been requested to try special settings by Customer Support. Automatically load IRender toolbar and function to automatically load the IRender toolbar and application whenever you start a SketchUp session. If you do not automatically load the application, then you need to select IRender: Load from the SketchUp plugins menu. If you have turned off the toolbars during a previous, you need to turn them back on from the SketchUp View/Toolbars menu. You can set the maximum number of threads to be used for rendering. The default is to set the number of threads to match the number of cores available. Setting a number greater than the number of cores may provide faster renderings. Setting a number less than the number of cores will render slower, but may speed up other functions on your computer.